Coverstar is a fully automatic vinyl pool cover system that is firmly fixed into two tracks. 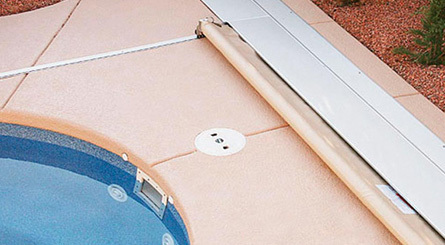 At the turn of a key, the rectangular shaped, automatic pool cover rolls on and off. Coverstar pool covers will hold the weight of adult, providing invaluable safety and piece of mind. 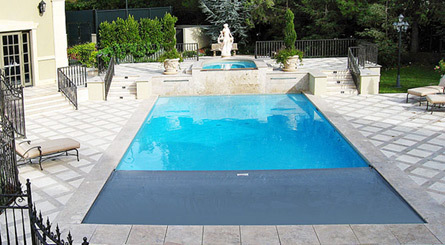 Coverstar pool covers seal out dirt, dust and leaves and will reduce the use of chemicals by 70%. Heat is also trapped in your pool, considerably extending your swimming season and significantly reducing your heating costs. There’s no need to put the things you value most at risk. The Coverstar safety pool cover system is designed to give you the kind of peace of mind you need to truly enjoy your pool without worries. Coverstar is key operated, so unauthorized access is impossible. When you want to have a swim, the last thing you want to do want to spend precious time and effort dragging a heavy cover off the pool. Because it takes so little time to open or close the Coverstar, you will use the pool more often. 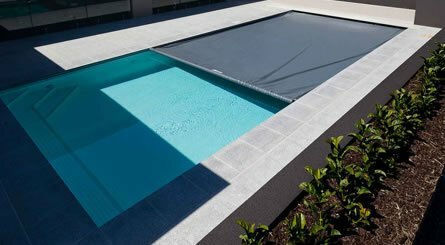 Like a lid on a pot, Coverstar Pool Covers eliminate 90% of evaporation. When pool water evaporates, it takes heat and pool chemicals with it. By stopping the evaporative process, your pool’s temperature is stabilized and pool chemicals retained. This maintains consistent chemical readings, ensuring the lowest possible chemical and energy costs. Pool filtering cycle times can also be dramatically reduced, often by over 50% if a pool cover is used frequently. Instead of filtering an uncovered pool 8-10 hours a day, just a few hours is all that is typically needed to filter a pool covered with Coverstar. Please note, the Coverstar colours displayed are for illustration purposes only. Please request a physical sample before ordering.